*Updates are taken from the most current data available from government entities, Long Term Recovery Organizations and FEMA reports. FEMA determined that thousands of homeowners who were affected by both the March and August 2016 "noncompliant" because they had recently or not yet completed their March rebuild and thus, did not yet have the required insurance on the rebuilt home. Because of this, these homeowners were denied any FEMA assistance. The state's RFP for the all-encompassing contract to run the federally-funded recovery program failed to specify that bidders must possess a state contractors' license. IEM (a team of contractors, engineers, consultants and attorneys) won the bid, but did not have a contractors' license. This led to an all-out battle between companies and shell companies hiding corrupt backers to win a contract paying between $100-250 million. Sadly, all of this only made it more difficult to securen needed additional federal recovery dollars. Homeowners who had already begun rebuilding prior to federal funds availability were required to stop work the moment that they applied for federal funds. This left homeowners, contractors and volunteer rebuilding organizations unable to make forward progress until environmental studies by the state were completed for each property. Tens of thousands of homeowners did not apply for federal aid. The reality is that an overwhelming number were so fatigued at completing endless forms for agency after agency and receiving no help that by the time Restore LA was up and running, it seemed futile. The state of Louisiana adopted a “Shelter-at-Home” strategy early in the recovery phase that provided minimal repairs to allow homeowners to remain in their homes while restoring the larger damage. This strategy provided basic shelter needs that included bare drywall surrounding 1 bathroom, a working toilet and bath/shower unit, bathroom and kitchen sinks installed in temporary 2x4 frames, a small refrigerator, microwave and hot plate and working electrical outlets in the "living" area. The remainder of the homes were left gutted until homeowners could find resources to rebuild. 18,000 households signed up for the program, but the repairs proved slow and it took months/years for most to get back into their homes. By mid-2017, there were 11,000 families living in Shelter-at-Home houses. There is no data on how many are still living in gutted homes, but rebuild organizations continue to report families living in substandard, unsafe and unsanitary homes. Although over 140,000 homes were damaged, FEMA provided only 4,000 manufactured housing units (MHU’s) for flood victims. Typically, FEMA temporary units are installed on a homeowner’s property, but these new MHU’s were too large to fit on most flood-damaged properties. For this reason, most homeowners were unable to utilize FEMA units. As of May 2018, there were still hundreds of families living in MHU’s, but as of that date, families were required to move out of the unit or begin paying rent to continue living in it. Most of these are homeowners who are still paying mortgages on homes they are unable to live in. Louisiana was awarded $1.3 billion in federal funds for flood recovery which is managed by the Restore Louisiana Task Force. Of that, only 14,370 homeowners have been awarded grants totaling $206.5million. Yet only $60.5 million have been disbursed. What is even more concerning is that the total administration and inspection costs thus far ($74.7 million) surpass the amount of homeowner disbursements. 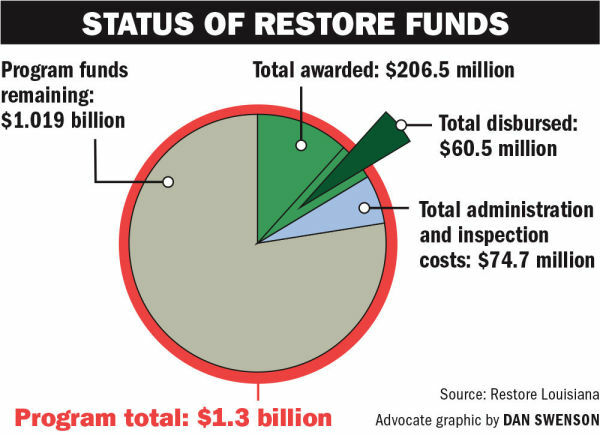 See chart (Status of Restore Funds). One issue is that FEMA required applicants to apply for an SBA loan in order to receive assistance. The amount of the loan was then counted as assistance received, which meant that an award of federal funds was considered a duplication of benefits, even though homeowners are required to repay the loan (in addition to their existing mortgages). Over 6,000 homeowners were denied federal funds on this basis. But in September 2018, a law was passed to waive the duplication of benefits caused by the SBA loans . . . but only until 2021. This legislation opens up approximately $215 million in federal grants for homeowners.